Binance is the fastest growing exchange for trading cryptocurrencies. In the short duration of 5 months, it has reached the 10th position among the top volume cryptocurrency \ exchanges. 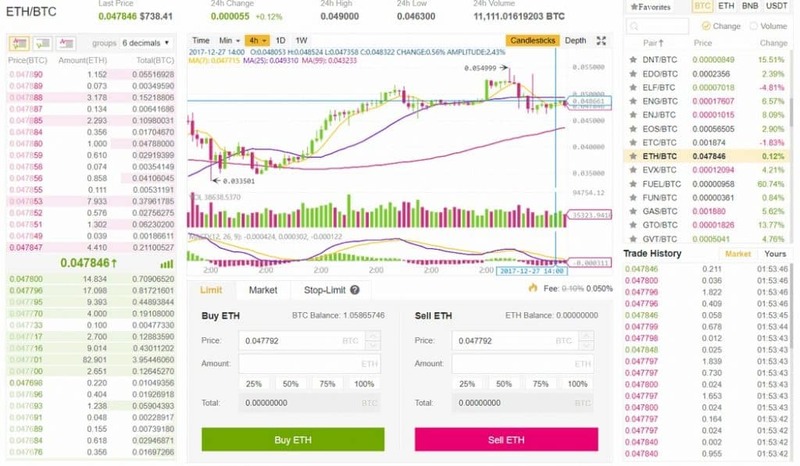 Binance has become so popular due to some of the factors such as availability in multiple languages, very neat user interface, and it also enables processing the orders at an extremely high speed. Binance exchange is available only for trading cryptocurrencies, hence, it is not available for any FIAT wired deposits. You can see a new feature named "Stop Limit" in this case You can manage you open order for example to buy with "1" number indicated in the next picture, It indicates the price when system will open a position, with number "2" it is the price just a little bit smaller the the price stop to open at this price the position, on the contrary in case you want to opena position to sell, in that case price limit will be just a little higher than stop one.